“Slideology” is an art unto itself, so this first in a series of “technology for learning” posts[i] will focus on one critical element of designing slides: cleaning up bad image content. Whether you create slides in PowerPoint, Open Office, GoogleDocs, or Keynote, one thing is central: slides must feature clear images and accessible content to be amenable to student learning overall. Creating clear, clean slides needn’t wait until you have a student request. Creating an image that projects better, prints better, conveys ideas more clearly, and leaves less to conjecture will benefit all students. This benefit is felt whether students use assistive technology or while learning in the classroom, in a favorite chair at home, or while studying in a coffeeshop. To provide on clear and brief breakdown of how to re-make the visual content of slides, this post will track the process of transforming one slide. [iii] The original slide was re-made as part of an upper division Biochemistry class that included a blind student with limited residual sight. Using the process noted below, teachers can apply changes suggested here in fixing most other basic, two-dimensional images. While a specific circumstance prompted the need to re-make slides in the Biochemistry course, the result of the slide transformation was summed up best by the professor: all learners in the class benefited from this effort to remove pixelated charts, graphs, photographs, and text. Slideology begins with good curricular design (http://wp.me/p1Mdiu-6g) and incorporates the elements of Universal Design and Course Design (http://z.umn.edu/idaportal). Ultimately, in this mindful design context, UDI results in the elimination of unnecessary barriers to teaching and learning while maintaining an academic focus on learning and essential course elements. In paying attention to presentation slides, a teacher addresses at least 5 of the 9 principles (Equitable Use, Flexibility in Use, Simple and Intuitive, Perceptible Information, Instructional Climate) and significantly improves the overall Information Environment. The slide below (Figure 1) is typical of image content provided by a publisher, or acquired from scanning the image out of a book. Regardless of origin, an instructor can insert a JPEG file easily into a slide. You’ll note that this slide contains a significant amount of information of which most is quite detailed and hard to read. Also, the image is small when compared to the size of the slide palette. While this image contains text, the text itself is still an image and inaccessible to many students with disabilities (more on that later). Class discussions may be confusing as there may be general references that are not immediately clear as to which molecular structure is being addressed. Finally, low image resolution means any enlargement, to include projecting, will result in a loss of image clarity (pixilation). The first trick is to find out what on this slide is really essential to instruction. If all four molecules are important (e.g. to compare and contrast), then enlarge the content to fit the palette and go from there. 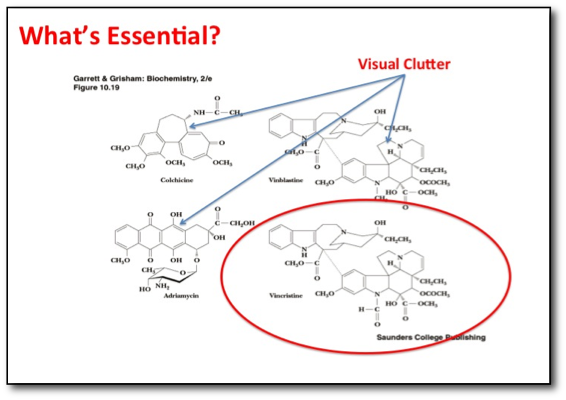 However, if the discussion really is about one molecule, then everything else on the slide is essentially, visual clutter (Figure 2). As the instructor, ask yourself “what is essential” for effective teaching and learning as you review each slide (http://studentaffairs.stanford. edu/oae/faculty/essential). Once essential elements are identified, crop the image and enlarge the remaining item. Enlarging an image increases the ability to see it at greater distances (larger classrooms), allows for better instructor interaction (not obscuring significant portions of the slide when interacting with the content), and will print better as the slide image won’t be so small (imagine the Figure 1 slide printed with six slides per page). 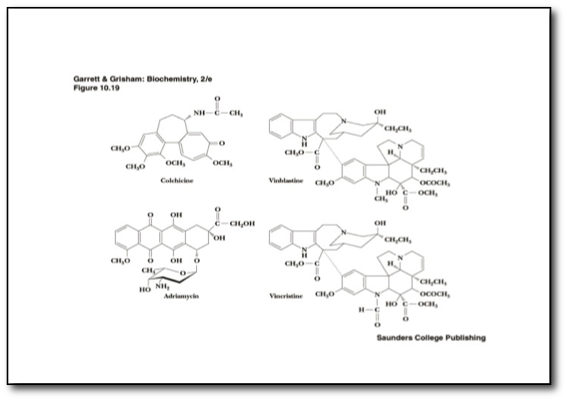 You’ll note in Figure 3 only one molecule has been displayed. 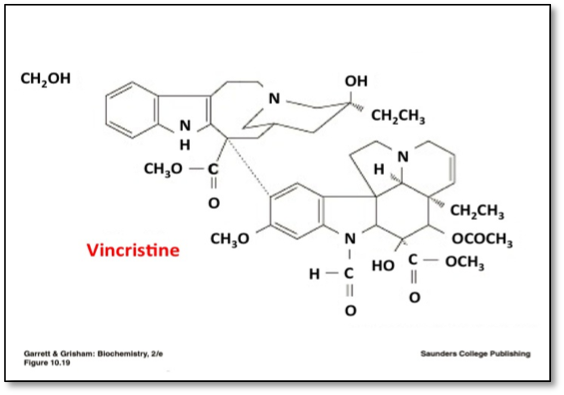 After a discussion with the faculty member regarding the previous slide, it became apparent that this was the only essential molecule out of the cluster of four; the image was cropped and the remaining picture enlarged to fit the slide palette. The last step in the process is to clean up the pixelation. Doing this improves the clarity for all students, but it has significant benefits for those with visual impairments. As you’ll note in Figure 4, adding text into this image resulted in sharper, clearer content that will enlarge easily resulting in improved projection and printing; you can also highlight important information through a judicious use of color. Choose image content that relates to the topic of discussion by enhancing the teaching and learning of that discussion. Edit selected images to focus on the essential elements of the discussion topic by trimming the visual clutter and adjusting the image size. If the image contains text, you will need to recreate the text using text boxes so that the content is more clear, as with examples in Figures 1 and 4. Pay attention to the resolution of an image. Poor quality images – even when they contain essential content – can negatively impact learning for most students. Look for an original source, ask the publisher for a better quality image, or create it yourself. Adjust image qualities if possible (e.g. contrast, brightness, color etc.) to visually enhance the image, seek to improve its quality for projecting and printing. Add alternate text (alt. text) to the image and ensure the text describes the essential elements of the image. Alternate text is critical for students with visual impairments but can benefit students with processing difficulties and even those who are English Language Learners. If you cannot add content to the image via alt. text, ensure you have this text description saved in the notes field of the presentation and let students know where they can find this content. If you are not able to create the written description (available time or software limitations), then you’ll need to incorporate a verbal description of the image in your lecture. The bottom line here is to ensure the essential elements of the image are conveyed to all students. Remember to use industry standard presentation software, and where possible, hardware. Applications such as Open Office, Google Docs, and Keynote all offer great resources and flexibility for faculty members, but have significant limitations in regard assistive technology. Even in the Microsoft Suite of applications including PowerPoint, the Windows version provides better accessibility tools alongside software for creating documents accessible to students with disabilities than does the Apple version. Since graphic images cannot be read/interpreted by text-to-speech screen reader software, the incorporation of readable text via text boxes and alt text/alternative text options will ensure that low-vision students have improved access to the image and can use a screen reader to identify the essential elements (http://webaim.org/techniques/powerpoint/). Creating the alt text and slide descriptions begins with scripting the essential elements of the image to be described. A middle step of this process is learning how to insert the alternative text within your presentation software. Commonly alt text entry is linked to the uploading and tailoring of images; alternatively, you could type the text directly in the Notes field of PowerPoint. Written descriptions can be supplemented, but not replaced, by an audio description using the PowerPoint recorder or by including in the alt text a link to the recording in Audacity or Garage Band or AudioBoo. As I mentioned at the beginning, Slideology is a skill to be learned and exercised with student learning and essential course goals in mind. As teachers we all need to grow our skills in using presentation software, so that the function and form of presentations become more accessible and, therefore, more beneficial for all learners. Additionally, in the process of re-making slides and adding verbal descriptions of a slide, we become more aware of points of spoken emphasis or patterns of connection typically conveyed orally in class. These insights – in this case perhaps about which chemical markers / interactions a teacher asks students to attend to first – can be drawn on to further clarify the points we make while presenting the new images as part of a class session. Vincristine: cancer chemotherapy drug; basic info: http://en.wikipedia.org/wiki/Vincristine. [i] For additional UMinnTILT posts on presentations, see: Zen and the Scourge of PowerPoint Monotony, and Time for a Makeover of Presentation Slides. [ii] For example, in a science or STEM course, the textbook publisher will have provided electronic image content. In other settings poor images often work their way into presentations when we inherit content from a previous instructor, or we incorporate into a new presentation an open access image from internet that fits our needs, or we want to convey newly released information so create a screen capture or scanned image from a paper document. [iii] This example is embedded in a presentation on Creating Accessible Presentation Slides; that slide set includes two additional examples of slide transformation. Nice explanation! Though the floating CH2OH would be distracting for students–that should be cut out too.